When I was a teenager, I always had a crocheting, embroidery or knitting project going. I'd come home from school, turn on a soap and needles would start clicking. I did get my homework done, but I loved that hour or so to unwind every day with just ATWT or Guiding Light and my thread. I would watch something beautiful and functional come together in my hands. Those types of crafts are too hard on my hands these days so I enjoy papercrafts and machine quilting. However, it is hard to do those things and watch TV. Fortunately, I can occasionally throw stamped images, blender pens, watercolor crayons and other supplies into a basket and camp out in front of a soap on a rainy afternoon like I did yesterday. 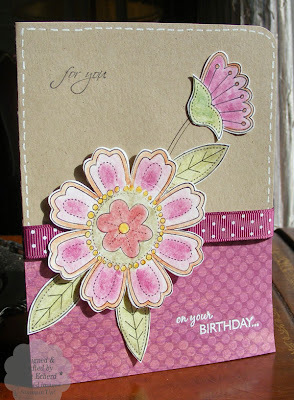 Here is one of the cards I assembled this morning with my colored images. General Hospital never looked so good!